Tinus Ehlers, and Belinda Ryan. Photo: Supplied. Canberra gardeners now have two new online tools at their disposal to help them grow plants that will thrive and survive in the ACT’s sometimes harsh and increasingly dry climate. 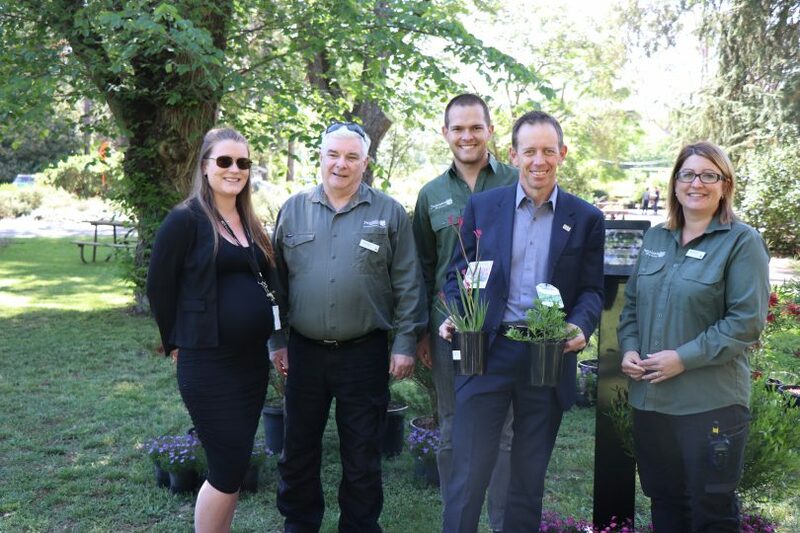 Minister for Climate Change and Sustainability Shane Rattenbury today launched the new Plant Selector and WaterRight tools, available on the Actsmart website, at Yarralumla Nursery. Mr Rattenbury said that climate change meant choosing the right kinds of plants and watering regime was becoming increasingly important. “Many of us have bought plants that have struggled or died, but with Actsmart’s updated Plant Selector and WaterRight online tools all Canberrans will have free assistance to choose appropriate plants for their garden and understand how to water them,” Mr Rattenbury said. He said Actsmart’s Plant Selector tool was specifically tailored for the Canberra region, and provided the latest information on a wide range of plants including plant descriptions, sun and shade tolerance, frost tolerance, watering requirements, fire retardant characteristics and origin. Based on the soil, vegetation and climate characteristics of Canberra’s residential gardens, the WaterRight Garden tool provides valuable information on how much water your garden and lawn require and the best time to water, without compromising their health. It also allows you to develop more accurate watering schedules for your garden, potentially saving money on your water bills in the process. “Choosing the right plants at the outset and creating a watering routine that is appropriate for your garden’s needs can save you a lot of effort and heartache down the track, and make a contribution to Canberra’s sustainability and readiness for climate change,” Mr Rattenbury said. To view the tools and access a range of tips to reduce your water, electricity and energy use please go here.